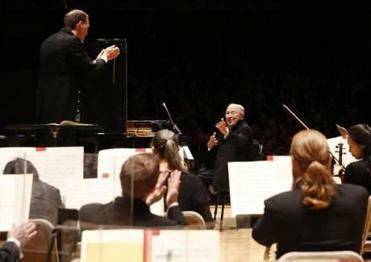 Menahem Pressler (right) joined the Boston Symphony Orchestra and Moritz Gnann. Boston Symphony Orchestra assistant conductor Moritz Gnann made his Symphony Hall debut Tuesday with an enticing program of Romantic music: Mendelssohn’s “Hebrides” Overture, Mozart’s Piano Concerto No. 27 (K. 595), and Dvorák’s Symphony No. 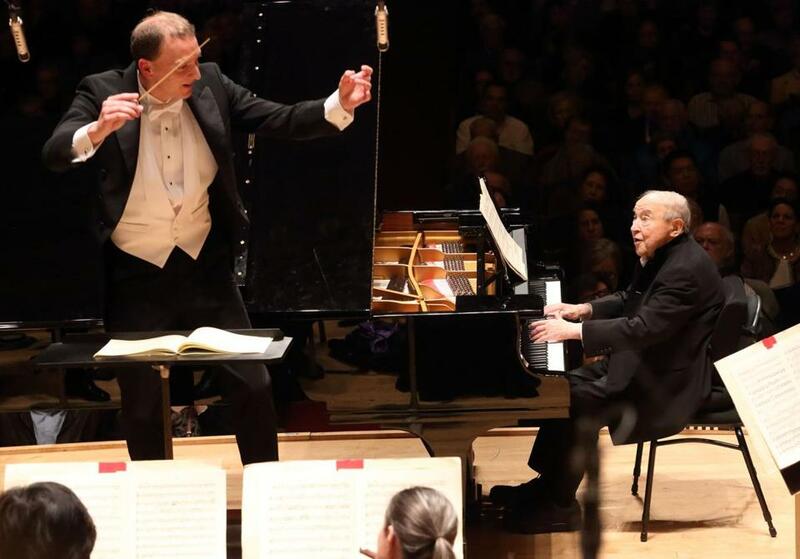 9, “From the New World.” It was a night to remember, for his own performance and that of his piano soloist, 92-year-old Beaux Arts Trio founder Menahem Pressler. The “Hebrides” Overture (Mendelssohn also called it “Fingal’s Cave”) was inspired by the composer’s 1829 visit to a cave of basalt columns on the Inner Hebrides isle of Staffa. Under Gnann’s baton, the tranquil opening phrase was the calm before the storm; there was thunder and lightning to follow, but also frolicking sea birds, before the tempest blew itself out. Mozart’s final piano concerto is a quiet, intimate affair, no trumpets, no timpani. It’s almost operatic in the way the instruments talk to one another, and though all three movements are in major keys, there’s a reflective sadness about it that calls for a performer with wisdom and experience. Gnann had the right soloist in Pressler, who’ll be 93 next month. Actually, Pressler would be the right soloist for any Mozart piano concerto: He has precision, polish, poetry, and, most of all, point. Best of all, he doesn’t play too fast. He does walk with a cane, and he did have a gentleman help him to the piano. When he arrived, there was an outburst of applause, and then another when Gnann, in a gracious gesture, leaned over and took both his hands. Pressler’s Mozart is clear-eyed and conversational, as if music were his way of talking. He asks questions; he provides answers; he goes off on tangents. That last quality is especially relevant to this work, whose themes don’t develop so much as wander into strange keys and harmonies. Pressler always knew exactly where he was going; he just wasn’t in any hurry to get there. And though he had a score in front of him and even turned the pages himself, his playing was so spontaneous, he might have been improvising. Gnann was a sympathetic accompanist, especially in the last two movements. After surgery in Boston to repair a life-threatening aneurysm, Pressler is back in the city — not as patient, but as star performer. At the end, Pressler blew kisses to the audience, then returned to play Chopin’s posthumously published C-sharp-minor Nocturne. This was just as idiomatic and riveting as the Mozart. After intermission, Gnann, not to be outdone, offered a distinctive reading of the Dvorák. The “New World” Symphony was written entirely in New York, and it’s a kind of letter home from America, full of discoveries like the pentatonic scale the composer thought he heard in Native American and African-American music. Dvorák even told the New York Herald that the middle movements were suggested by scenes in Longfellow’s poem “The Song of Hiawatha.” Yet in the symphony he never really leaves his Czech homeland behind. Gnann let it all unfurl without pushing too hard. The first movement (whose exposition repeat he omitted) was full of contrasts, with a tender second theme and dramatic climaxes. The conclusion was ferocious, but all the more transparent for not being whipped into a frenzy. Grace Shryock’s poignant English horn solo anchored the Largo, and Gnann was passionately animated in the middle section. The final two movements were more extroverted, and there were some odd balances in both. He saved the best for last: The dirge-like coda built very slowly, creating suspense, and the climax didn’t explode so much as bloom. Throughout the performance, Gnann made you stop, think, and reconsider. No small achievement in such a familiar symphony.